So, being geeks of the unemployed and practically moneyless persuasion, several of my friends and I all entered a Competition/”Giveaway” to win tickets for the event. And each and every one of us won. On further investigation at the event itself, I found that many, many more people had also “won”, which has led me to feel as though it was somewhat of a scam. We were told that our winnings were free tickets for the event, and we were encouraged to purchase on-site accommodation and a “VIP Package” that would give us lots of upgrades that were not available with standard entry, or lower packages. We decided to purchase it for our group of four, and we booked our travel soon thereafter, very pleased with ourselves at the deal we were receiving. On arrival, many of the VIP Exclusives were unavailable to us until the next day, or even the day after that, and some of the advertised bonuses – such as the “VIP Bar” – were not even available, due to a change in the organisers’ plans. 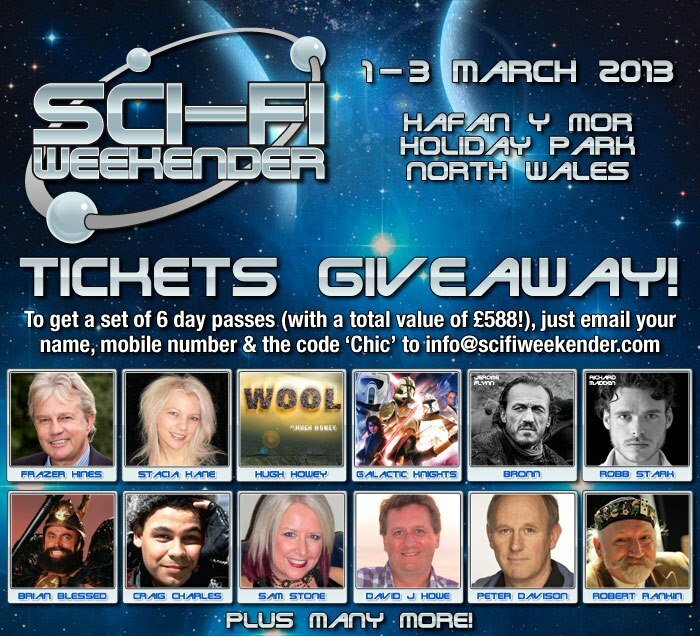 The “Exclusive Goody Bag” contained only a single novel (of horror theme, not science fiction), some Sci-Fi Weekender themed mini-badges and bookmarks, and leaflets advertising their other events. Extremely disappointing, and hardly what you would expect from such a prestigious, sizeable convention. Many of the staff seemed to have little to no knowledge as to what the VIP Passes actually did, and security let myself and fellow journalist Lord Matt into the “VIP areas” without actually asking for identification. On face-value, however, the fact that you receive a Signing Pass which is not available to standard ticket holders, the use of a ten percent discount card (though it took two days for us to actually receive ours, by which point I had already spent a great deal of undiscounted money), and the VIP Seating Area all had their welcome advantages, along with accommodation which was, according to many attendees that I spoke to, far superior to the standard option. It is a good concept, but it needs better organisation, and less false advertising. The fact that some of what was advertised became unavailable due to a change of plans, rather than “circumstances outside of our control” (which would have been acceptable) I found to be exceedingly unprofessional. I shant be upgrading to VIP in the future unless staff are better informed and absolutely everything that is advertised is in fact given to me, on my day of arrival. As a disabled individual I found the layout of the convention to be very difficult, and painful. 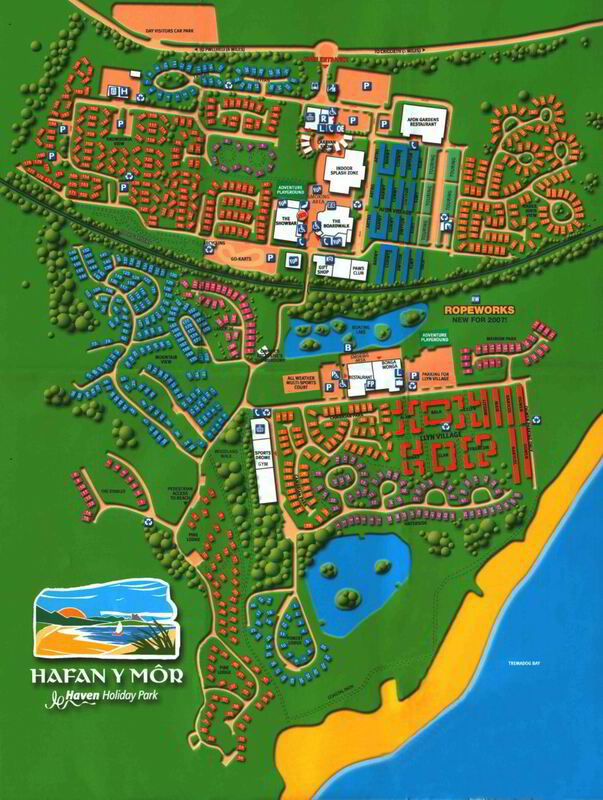 The main units for accommodation are a fair ten minute walk from the main halls where the Talks, Guests, Dealers, etc, are, up a long hill. There is a hall that is closer, where the Sci-Fi London Screening Room and the restaurant was, but the problem I had is that I was not simply there for the films, so I had to do that trek at least twice – once in the morning, once in the evening – every day, and for me, it took closer to half an hour each time. On discussion with the staff on Reception, for both Haven (the Holiday Park where the event is held) and “SFW” (Sci-Fi Weekender), I was made aware that there are in fact disabled caravans that would have been more suitable for me, but I only complained on Saturday afternoon, and we were leaving on Sunday, so changing accommodation with only one night left seemed like a pointless hassle. They recommended that, should I decide to return next year, I inform them of my requirements when I book, so that they can give me use of “Adapted Caravans“. However, these caravans may be closer to the main halls, but they are just as far from the Sci-Fi London Screening Room and restaurant, so the problem is only lessened. I was also informed by a fellow attendee who is wheelchair-bound that her wheelchair does not actually fit through the doors of their Adapted Caravans. This seems a tad counter-productive. There are plenty of disabled toilets available, though quality and maintenance of the conditions varies around the site, a disabled viewing area is available in each part of the event – the VIP areas included – and there were many disabled access ramps for those with wheelchairs. So, though this event is far from disabled-friendly, they do seem to be making a welcome effort. I have researched this convention, and found that, for the last few years, it was run by popular science fiction magazine SFX, alongside a specialist company who organise many music festivals and other events around the United Kingdom. However, this year, the aforementioned events company took the reigns of the convention alone, with SFX backing out for unknown reasons. Now, I am open minded. Though they do not have SFX’s backing this year, I will give them the benefit of the doubt. However, I am not sure that they can manage such a large, science fiction themed event on their own. The convention itself was not as planned. Several actors cancelled at the last-minute and the schedule had to be rearranged with barely days left on the clock. Most of the Guests were authors and Editors, and for horror and fantasy fiction, rather than science fiction, which leads me to believe that they want to run a generally “geeky” convention, rather than a science fiction one, which is not what is advertised. The events schedule was not released until a week or two prior to the event, and only to those who had purchased tickets, it was never published online. The Guest List on the website was also extremely inconsistent, with the News section stating cancellations, but the Guest List section still listing actors etc who were apparently no longer available for attendance. Both these facts meant that, to be quite honest, the convention was far from what was promised, or expected. I feel as though they have cashed-in on the established fan-base and reputation of the events that had been in years past, and hiding the schedule of events until you purchase tickets based on that reputation alone is unprofessional and to be quite honest, downright appalling. This event was advertised as a three day one – Friday, Saturday, and Sunday – with a special advanced preview day for VIP ticket holders. So, as a result, myself and my party, along with many other attendees that I spoke with, booked return travel for Monday. However, on examination of the schedule when it was released to ticket holders, and after speaking with staff, we were informed that Sunday was in fact “pack up day”, that there were no Talks, no activities, only a few trade tables in the trading hall. So this meant that we had an entire day left to “kill”. This was all due, again, to the lack of publicised scheduling, and false/poor advertising. When I spoke with management from Chic Festivals about my concerns that they were cashing-in on SFX‘s prior involvement, about all of my negative disabled experiences, the VIP Pass inconsistencies, the lack of schedule until you purchase tickets, etc, I was told that if I do not like it, I am welcome to not attend next year. They seemed very cross by the sheer mentioning of the magazine’s prior involvement, and any sign (there was a Press Release published earlier last year) of them has seemingly vanished from the website, giving me the impression that the two companies parted on poor terms. As aforementioned, I am open minded, I was willing to give them the benefit of the doubt. No event is going to run smoothly in its first year. But, having been told that it is in fact “not” the first year of the event, that they are “experienced” (in mostly music events, judging by their website), and been treated as though my constructive criticisms were in inconvenience to hear let alone deal with, it is clear to me that these organisers are neither science fiction fans, nor professional in their outlook on running the event. I am exceedingly disappointed, and upset, by their lack of empathy and organisation. All the VIP “benefits”, cold-shouldered organisers and my difficulties as a disabled person aside, looking at the convention from the perspective of a standard visitor (not VIP, nor disabled), I can see the appeal of the convention; the people and the entertainment. Wondering around the event, I found everyone to be friendly, funny, social, and of course, geeky. Staff and attendees were generally rather geeky, lovely people. I made many friends throughout the weekend. It felt as though, no matter the problems I experienced, it was worth every penny just for that. The Talks were varied, entertaining and interesting enough, with book authors, actors, directors and so forth, but the sound quality was really quite dire in every room, which was a real let down. For such a large convention, I would expect them to have superior sound and technicians on-hand at all times, should anything go wrong. In particular, the V For Vendetta (image above) live play was utterly ruined by the sound conditions, much to everyone’s disappointment, as it looked like the script, directing and acting were really fantastic. 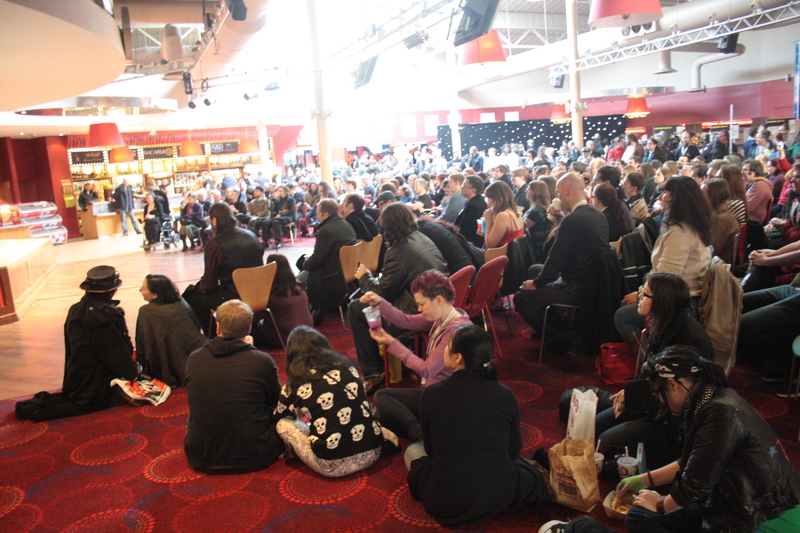 The entertainment – live music, a stage production of V For Vendetta (image above), Britain’s Got Talent semi-finalists Area 51, costumers Galactic Knights and others – was very enjoyable. In particular, there was a nice bit of variety in the evenings, with attendees being able to select from the films on show at Sci-Fi London‘s Screening Room, or the various live entertainment options, including karaoke, comedy, music (the infamous Professor Elemental and DJing Craig Charles both performed on Saturday night), and even a “game show” pitting two Guests against one another in their knowledge, skills and popularity which had crowds of all ages in fits of laughter, plus a party (or sometimes two) every night. Cosplay (“costume play”, translated from Japanese) was also in abundance, with literally hundreds of people in costume every day, especially on Saturday night which featured a Cosplay Competition judged by several of the Guests, though to the best of my knowledge there was no Masquerade, which is a shame. The way that the competition was run received mixed reviews from cosplayers who I spoke to, some finding the system organised, some finding it a complete mess. Myself, I found it to be just plain confusing, with a lot of people not even knowing the where or when of any of it was. Perhaps next year they should bring in a professional cosplayer to help them organise the cosplay side of things better. The trading hall, though impressively sizeable, was also crammed into a rather small area, was very loud and claustrophobic, and was full of completely unrelated, non-science fiction traders. Why there was a physic reading palms continues to bemuse me. I think greater care needs to be taken to assure that the traders there are appropriate, and more space given. The Gaming Zone was far, far too small. I was informed by the organisers (Multiplay) that they were promised a larger area, so yet more false advertising there, even to those involved in the event itself. At one point there were actually children playing an over-18s game, Call Of Duty: Black Ops zombies mode, but after I informed them of the legalities involved, they promptly put someone in charge of ensuring no children were playing, or even watching, which was good. The games being showcased were varied, from Minecraft to shoot-em-ups to racers, and there were several impressive PC setups, and a wonderfully comfortable Xbox 360 arrangement. This definitely needs expansion next year, lots of potential. The on-site activities (golf, laser tag, etc), and the range of food and drink available were superior to any event I have been to priorly. I am disappointed by the fact that the activities at Haven required additional charges, but apparently the park is closed and out-of-season, only open for this event specifically, so it is perfectly justifiable. The food and drink is actually relatively standard in its pricing, too, with Burger King and Starbucks costing about the same as they would normally. The “traditional fish and chips” seemed like the best deal, so I purchased a large fish and portion of chips there, but to be quite honest, I found the portions to be far from large, and I wished that I had gone to Burger King or the pizzeria instead. Conclusion: Will I Return Next Year, And Should You? Though my personal experiences were rather problematic, most of the VIP tickets have, apparently, been almost sold out already for 2014, so it is clear that a lot of people did actually enjoy their weekend. No event is perfect, and this is far from it, but I see a lot potential, if only they would listen to the fans (I recommended a feedback form of some descript, but they shot down the idea) instead of assuming that they know what they are doing. Running dozens of music-based events around the world does not necessarily mean that you know how to run a science fiction event. To their credit, it does mean that the entertainment is pretty darned amazing, but the Guest list and the Trading Zone both tell me that they do not understand the concept of “sci-fi”. Their organisation and professionalism, as aforementioned, also has a long way to go. I would like to return next year, and I would like to recommend that others do as well. The entertainment, as I have said, is fantastic, the people are lovely, the on-site activities are fun, and the Talks were informative. That said, I cannot, in good conscience, recommend that anyone – myself included – spend that high a price on an event unless there is a schedule and Guest List released before payment is taken. If any attendee does this, they are encouraging the organisers to continue treating us like income, rather than fans, and giving them license to be unprofessional. If the schedule and Guest List are announced well in advance, and you like what you see, by all means, go for it! You will enjoy yourself, potentially. If you are disabled, however, please be aware of the difficulties that I encountered, and ensure that you inform them of your requirements before booking. I can also recommend that, to be quite honest, it might be more financially viable to book accommodation off-site, especially if you win the “Competition” they will doubtless be running again next year for free tickets. We stayed on Sunday night at the rather quaint, reasonably priced self-catering establishment Y Castell (full review to follow), who said that, should we return next year, we are more than welcome to stay with them, and they can even arrange for a discount with a local taxi service. At £20 per night, per person, or perhaps even cheaper elsewhere, plus travel (the cost for which can be split between your party if you are going as a group), it is actually far less pricey, and possibly more comfortable than the accommodation offered on-site. So, in short, though I had a rather poor experience this year, I would love to return again, if positive changes are made to ensure that fans are treated with the respect that they deserve (even the merchandise on offer seemed patronising), science fiction is, well, science fiction, the layout is improved, and of course, professionalism becomes a priority. It is absolutely essential that the Guest List and Schedule be announced well in advance, or I for one will not be returning. This entry was posted in Events, Reviews and tagged conventions, events, geek, geek 2013, geek margate, journalism, national express, personal progress, photographs, photography, sci-fi, sci-fi weekender, sci-fi weekender wales, science fiction, scifi, scifi weekender, sfw, sfx, sfx weekender, wales by Illisia. Bookmark the permalink. A fair review for the most part, and I agree with pretty much all of it. 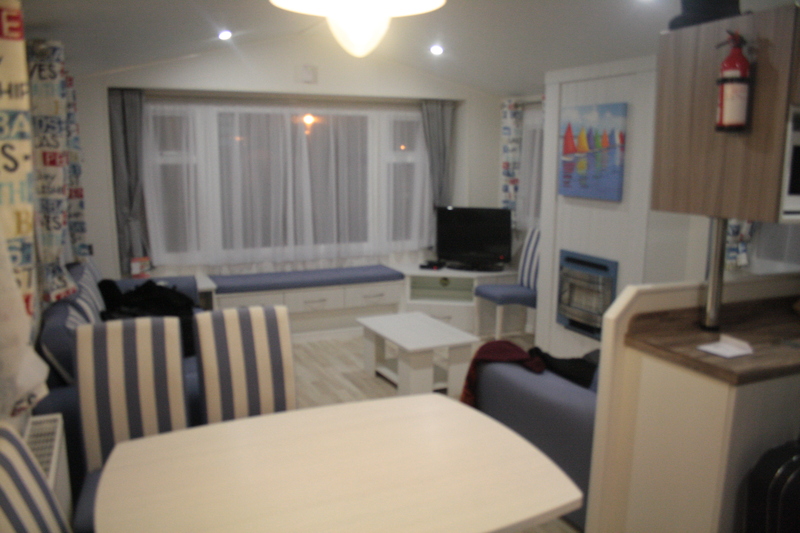 I have sampled the VIP and the Standard accommodation having been the past 2 years, and without a doubt, the caravans are much more welcoming, warm, and well.. clean. The Haven facilities themselves felt a bit dated and lacking. The pool was open, but very few of the park slides were open and it left us with little to do in there. I understand that there is potential in returning, and there are many upsides.. the people and the beach strolls are exciting, but the organisation seemed so terrible that I knew days before I set off that it was going to be a shambles; my friend actually received an email for staff asking if we would like to share accommodation with strangers to free up more accommodation for others. Seeing the room we were in anyway, I expect one of us would have been taking the sofa bed. Unpleasant is a kind word. I certainly won’t be going again. At all.